If you have a suggestion for a future episode of the GCU, leave it in the comments section! 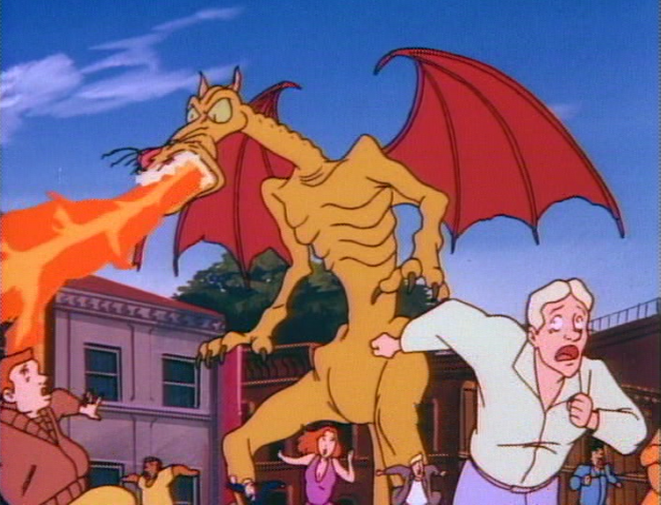 THE STORY: Ray Stantz is returning home to Morrisville (about 30 miles from New York City) to be the grand marshal of a parade to that is held every 10 years to celebrate that no one has seen a creature called the ‘Winged Puma’ in over 100 years… Upon arriving in Morrisville, Ray is welcomed by the Mayor (who calls him Roy Stantz), greeted by his childhood crush Elaine and an old ‘friend’ and clear slimeball Alan Favish, who points out to Ray that everyone expected him to one to make it big, instead he runs a shoe store in town while also pointing out that Elaine has inherited an old house that is haunted… which plays right into Ray’s desire to show off exactly what he can do. 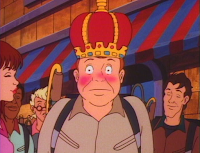 Unfortunately for Dr. Stantz, this is all apart of plot by Favish who uses spells to enhance the ghosts to where they can resist the capture streams of Ray’s proton pack and publicly humiliates Ray who returns to Spook Central with his tail between his legs as the Mayor declares that Favish will be the grand marshall. However Ray can’t let it go and returns to Morrisville and has the same difficulties as perform, but this time the rest of the Ghostbusters show up as well, unknowingly playing into Favish’s plans as he de-powers the ghosts making them easy to bust. 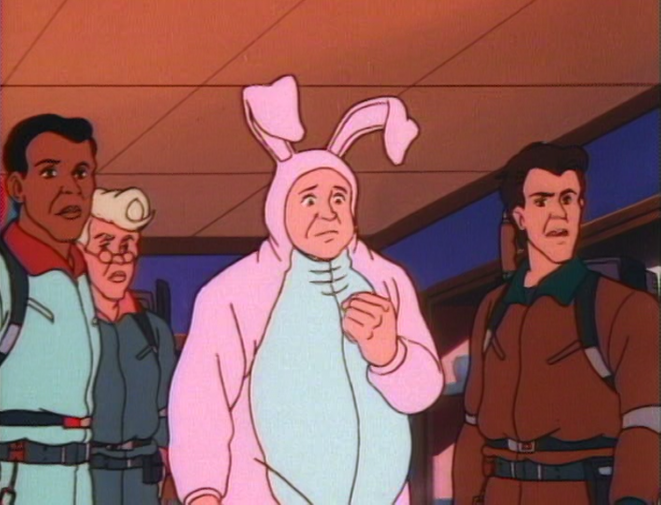 The humiliation Ray feels leads him to quit the team and actually take a job offered by Favish to be a bunny-suit wearing shoe salesman. 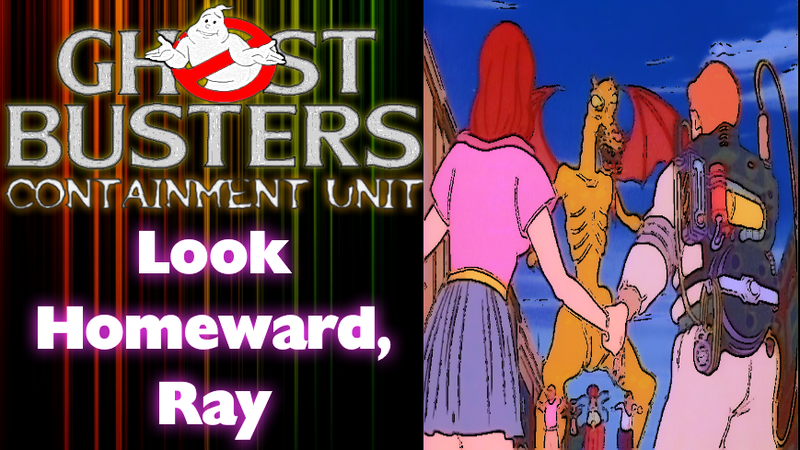 Seeing their friend is in need a confidence boost, the other Ghostbusters come up with a plot to dress Slimer up as a ghost they can’t handle to bring Ray out to their rescue, but this backfires when Slimer sees an ice cream truck and Ray seems destined to his fate, until he and Elaine find Favish’s spell book and learn what’s going on… just as the Winged Puma awakens, apparently from all the energy that was used because of the spells Favish cast. In great irony, Favish tries to deal with the Puma but is chased and his shop is destroyed.Ray rejoins the Ghostbusters, reversing the polarity on the capture streams and using a giant balloon of himself and shoe float, they pursue the Winged Puma and capture it in a daring mid-air zap & trap. Ray is declared the Grand Marshal of the parade once again, gets a kiss from Elaine & all is right with the world. THE REVIEW: This episode is great little trip into the past of Ray of where he came from, but also how fragile he is as character, for he is considered the ‘heart of the Ghostubsters’ thanks to his childlike wonder about certain things. While eager to show off, Ray getting dishearten to the point of quitting the team reveals that Ray puts a lot of pressure on himself to succeed and that he is very much proud of his accomplishments. 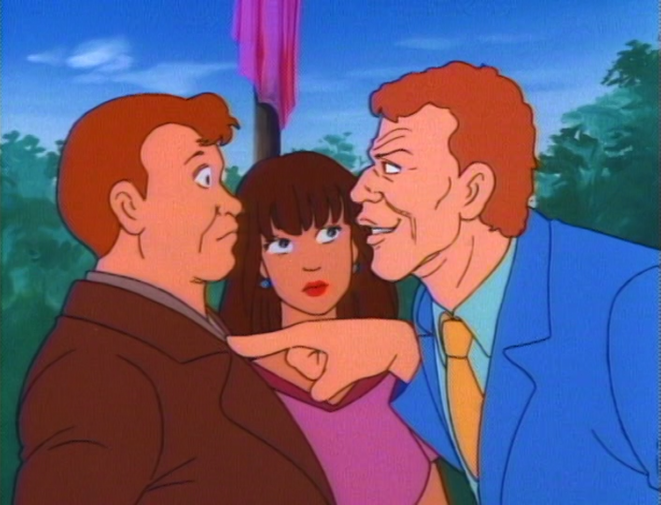 At the same time, Favish is too easily telegraphed as the villain in this story based not only on his design but attitude, and it takes a bit of the mystery out of ‘what’s going on’ when the viewers can see Favish causing the trouble right off the bat. 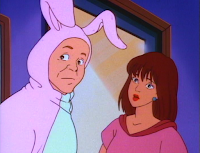 The character of Elaine is also a nice link to Ray’s past as he clearly still likes her a lot and would like to go out with her after the crisis is over with. 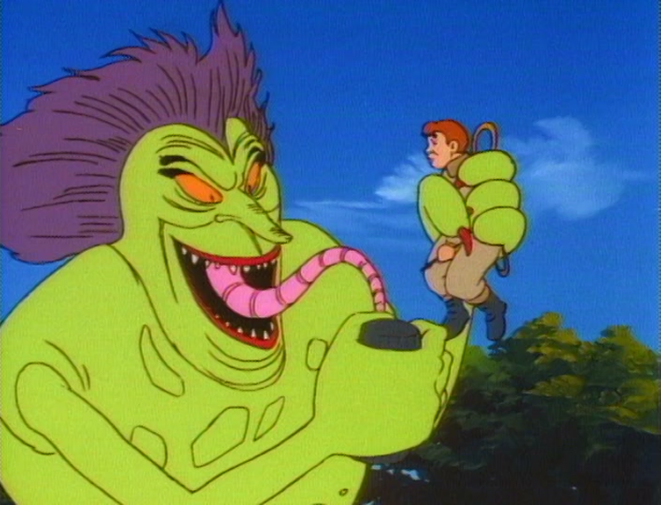 Beyond this this episode has a great use for Slimer, disguising him as another ghost is quite brilliant and until you actually hear the spud’s gurgles and burbles you think it’s maybe another ghosts, cause Slimer actually ‘attacks’ Peter Egon and Winston in a much different manner, using vines to hold them at bay. 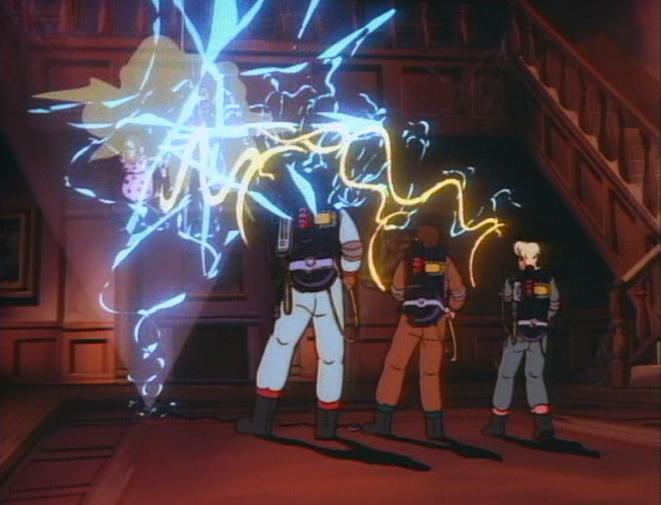 Sure it’s clearly staged to hae Ray be the hero, but Slimer’s tactics are pretty effective in disarming the Ghostbusters. And lastly lets talk about poor Wintson, who not only places a foolish bet with Peter over the odds of Ray returning to Morrisiville, but clearly saw some stuff in this episode that he turned white. 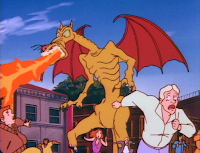 Yes, one of the more famous errors when it came to animation for the Real Ghostbusters see a rather peachy-colored Winston appear towards the end of the episode. Yes color mistakes was pretty common with cartoons back in the 1980s, Teenage Mutant Ninja Turtles is notorious for it, for something like to happen on a show where there is only one black character as part of the main cast, it really sticks outs when one considers Winston’s big line from the first movie. 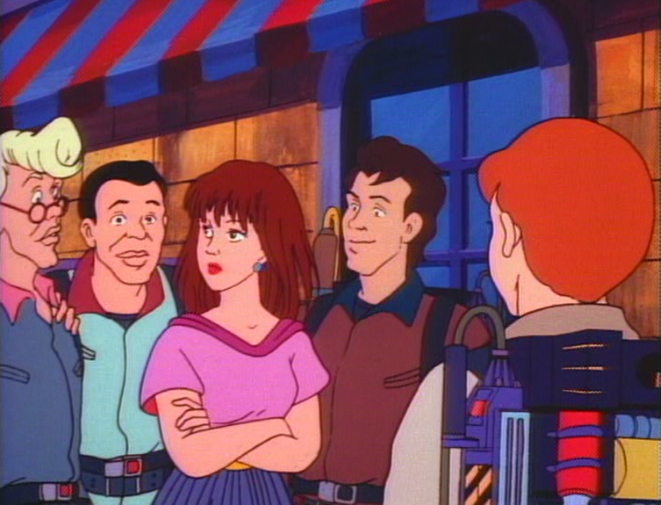 Next time around, in two weeks, we’ll be bouncing back to Extreme Ghostbusters to talk about Darkness at Noon Part 2, after that the door is open so if you have a suggestion for an episode of The REAL or Extreme Ghostbusters for me to review, leave it in the comments section below!